John F. Kennedy Park in Richmond, California, was once the core of community's social life. Neighbors who grew up near the park and still live in the area. But the park has aged, and hard times in the surrounding neighborhood have left its facilities little-used and in poor repair. Now the community is working with the City of Richmond to revitalize the park as a safe and vibrant gathering place. The Trust for Public Land helped host several community workshops for residents to voice their dreams and ideas for the new park. The resulting design makes full use of the park's seven acres to provide a range of vibrant and experiences and amenities that people of all ages can enjoy. Community commitment to the park is strong. 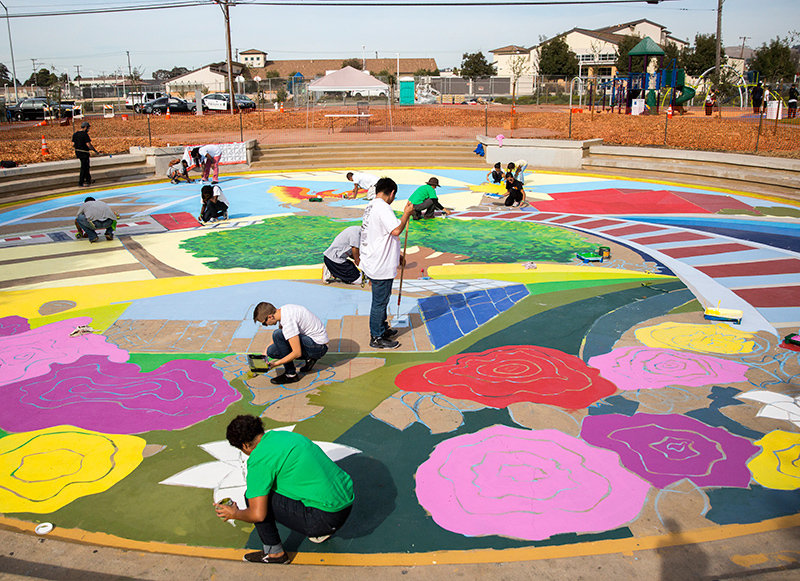 On October 24, Richmond residents and volunteers from all over the Bay Area will complete the park transformation in a tremendous community-build effort. The new park will include a new children's play area, a mural in the event plaza, the city's first Fitness Zone® exercise area, a fitness trail and walking loop, picnic areas, a victory garden, and a STEM outdoor learning pavilion. In celebration of Arbor Day, over 50 trees will be planted in the surrounding neighborhood on that same day.